There seems to be a fair share of things to do in Jacksonville Beach—from grabbing a quick bite to eat at a local favorite or throwing a few lines off the pier, to the hoppin’ night-life scene of drinking, dancing, and catching a few live sets at one of the local bars. Prior to these times, however, a different scene occupied beach life. As early as 1885, the central portion of Jax Beach was occupied by “The Boardwalk,” a five block strip along the coastline that served as an amusement venue for several years. The Boardwalk had several stores, including restaurants, grocers, bakeries, laundromats, and drug stores. The Boardwalk also featured a pavilion, built by The Jacksonville and Atlantic Railroad with the hope of attracting more occupants to the beaches area. The pavilion had a huge floor that visitors could use for roller skating and dancing. Another major attraction included in The Boardwalk’s area was the luxurious Murray Hall Hotel. The hotel was a 193 room, 350 guest facility that was steam heated, had open fireplaces, a playroom, billiards, a bar, and an orchestra ballroom. The hotel also generated electricity and had an artesian well that supplied water to the Pablo Beach. Unfortunately, much of the area surronding The Boardwalk burned to the ground as a result of a boiler room fire on August 7th, 1890. The next phase of the Jax Beach amusement park scene came in 1905, with the construction of The Pavilion. Eventually, The Pavilion would be completed, expanded on, and come to be known as Little Coney Isaldn. Little Coney Island was huge, covering nearly an entire block of the beaches, near whaty is now First Street. Little Coney Island was very popular among both locals and tourists, and featured attractions such as a bowling alley, dance floor, swim room, concession stands, stores, and roller skating rinks. However, Little Coney Island, aged badly, and quickly, due to its wooden structures facing constant ocean winds. An issue with contracting resulted in Little Coney Island being torn down in 1925. Another phase of the Amusement Park scene in Jax Beach included Shad’s Pier, which opened in 1922. Shad’s Pier began with the work of Charles Shad, and his desire to build a dance pier the jutted from the boardwalk. With the help of Martin Williams, the construction of the pier began. Shad’s Pier was a place for visitors to dance, fish, and relax. Shad himself installed a generator and strung lights, lighting up the entire structure so it could be an extravagant sight from miles away. Music could also be heard from several miles away, as major bands often visited and performed. Shad’s Pier became “Trotter’s Pier,” after Shad passed away, Williams took over with his new partner, Hawkins. Around the same time, W. H. Adams, Sr. created the Ocean View Pavillion amusement park. Adams built Ocean View on the former ground of Murray Hall. Part of Adams’s vision was that he wanted to construct a roller coaster, larger than the one that had been seen at Little Coney Island. The ending product was a 93-feet high coaster, with its cars reaching up to 50 miles per hour. Unfortunately, due to its size and being so close to the beach, the coaster was extremely vulnerable to damage. Eventually, the coaster was deemed unsafe, and was destructed and replaced by the smaller “Wild Mouse” coaster. 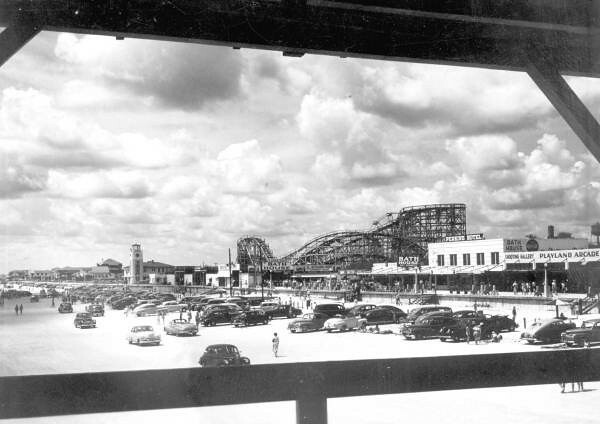 The park had lost a lot of business with the loss of the huge, distinctive coaster, and by 1949, the Ocean View Pavilion began to turn. Eventually a fire put an end to Ocean View, only a few years later. The end of the amusement park glory days came with Platyland Park, which was located only a few blocks north. Playland Park was similar to most “fairs” we see today: Ferris wheels, bumper cars, Tilt-A-Whirls, etc. There was also a “penny arcade,” with pinball machines and arcade-type games. Today, Jax Beaches only “amusement” park is Adventure landing, located on Beach Boulevard. Adventure landing features arcade games, go-karts, and laser tag, as well as a water park featuring fountains and water slides.